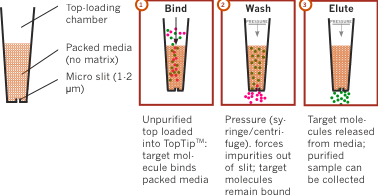 Protein/Peptide Enrichment TopTip micro-spin column enables separation of low-concentration/volume samples. The fine 1-2 µm slit at the bottom of the TopTip permits liquid to pass through (via centrifuge or syringe), but retains media in the tip. This unique design eliminates the need for a filter – reducing dead volume, loss of sample and contamination risk. Learn more about TopTip technology. SCX: Wen-Ping Chen, et al. Cohen Microscale analysis of amino acids using gas chromatography–mass spectrometry after methyl chloroformate derivatization. Journal of Chromatography B, Vol. 878, Issue 24 (2010), p. 2199-2208. SSA: Scott J Walmsley, et al. Proteomic Analysis of Brush Border Membrane Vesicles Isolated from Purified Proximal Convoluted Tubules. Am J Physiol Renal Physiol (3/10/10). HIL: W Fremout, et al. Tryptic peptide analysis of protein binders in works of art by liquid chromatography-tandem mass spectrometry. Analytica Chimica Acta, Vol. 658, (2010), p. 156-162. Click the button below to add the Protein/Peptide Enrichment TopTip to your wish list.